For a quiet girl growing up in the peaceful Los Angeles suburb of Chatsworth, reading opened up an amazing world. Jenny Yang made a trek to the library each week to check out a stack of books. Fiction was her favorite, but she also liked reading about science. “I just liked learning about the world,” she said. Now Yang has found a career that merges her curiosity about the world and her passion for protecting our Earth. As an assistant professor of chemistry at the University of California, Irvine, she creates catalysts that can be used in clean energy technologies. Catalysts are handy substances that speed up chemical reactions. The catalysts themselves don’t change in the process, so they can do their work again and again. Yang is a rising star in her field. She has been honored with a National Science Foundation Career Award, a Hellman Foundation Faculty Fellowship, and the Department of Energy Early Career Award. She also has become a mentor to other young women building careers in chemistry. Even as a young girl, Yang was drawn to science. Reading about the inventions of Leonardo da Vinci fired her imagination. And she spent hours leafing through an anatomy book her parents had. “I wanted to know, what is your appendix for? What are your tonsils for? Why do you have hair, and what is it made of?” she recalled. In high school, her favorite class was chemistry. She loved spending Saturdays at special chemistry labs offered at her school. Instead, what captured her imagination was learning about the elements that make up everything around us. “I liked to understand the laws that governed the world,” she said. Yang’s dad is an electrical engineer, and both of her parents encouraged her to go into a STEM field. She decided to attend the University of California, Berkeley, and major in chemistry. In her freshman year, Yang found a research position in a geochemistry lab. Her lab group was trying to figure out how contaminants from nuclear waste sites move through the soil above the water table. Right away, she was hooked. Working in another chemistry lab at Berkeley, Yang synthesized magnetic metal clusters that could be spun up or down. These molecular magnets had potential applications in data storage. She was excited by the idea of making new molecules. “I remember thinking it was so cool to have a new compound in a vial that doesn’t exist anywhere else in the Universe,” she said. While she was an undergraduate, Yang had summer internships at Lawrence Berkeley National Laboratory and the National Renewable Energy Laboratory in Colorado. The experience at NREL awakened her interest in finding alternatives to fossil fuels. Yang received her B.S. in chemistry in 2001. For graduate school, she headed across the country to the Massachusetts Institute of Technology. There she worked under Daniel Nocera, a leader in the chemistry of renewable energy. Yang received her Ph.D. in inorganic chemistry in 2007. She did postdoctoral work at the Pacific Northwest National Laboratory in Washington State and became a staff scientist there. In 2011 she moved back to California to join the Joint Center for Artificial Photosynthesis at the California Institute of Technology. While Yang was at Cal Tech, UC Irvine recruited her. University officials were eager to bring on this up-and-coming researcher. They also were committed to having more women on their faculty. They told Yang about the school’s commitment to women and to work-life balance. She joined UC Irvine in 2013 as an assistant professor, teaching classes and running her own lab. 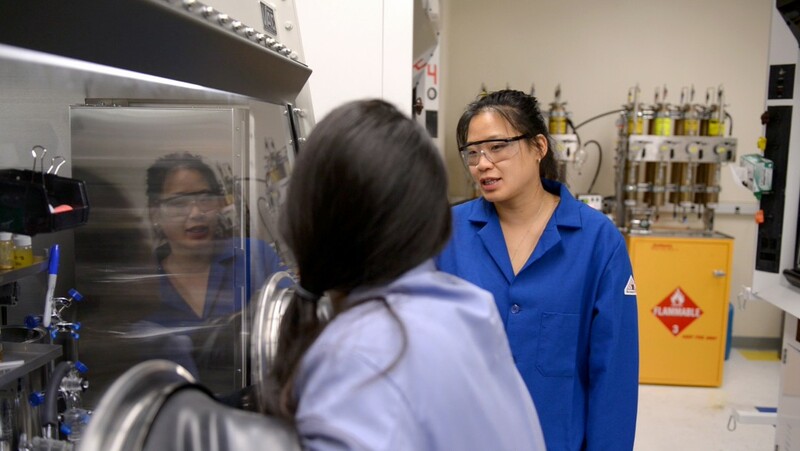 Yang and her lab group work to develop metal catalysts for the production of fuels from clean energy sources. One goal is to find better catalysts to break apart water (H2O) so the hydrogen (2H) can then be used in nonpolluting fuel cells. Yang finds that young women often need extra encouragement to keep going in a traditionally male-dominated field like chemistry. When a female student is feeling insecure about her abilities, Yang will offer a pep talk. Yang also encourages up-and-coming scientists through a program called LEAPS (Laboratory Experiments and Activities in the Physical Sciences). Twice a year, middle school students from underserved communities visit UC Irvine labs. In Yang’s lab, the young visitors do an experiment where they coat a penny with zinc to turn it silver. Then they heat the penny to form a bronze alloy, which turns the penny gold. At the end of the day, the students fill out a survey. “The survey asks what was the most memorable part of their day, and it’s really exciting to me when the students say it was one of our experiments,” Yang said. One of the biggest challenges we face is finding ecofriendly alternatives to fossil fuels. Jenny Yang’s lab at the University of California, Irvine, is working on a key piece of that clean energy puzzle. Most of our activities—from driving cars and cooking meals to taking hot showers and watching our favorite TV shows—rely on fossil fuels. But these fuels—coal, oil, and natural gas—have huge downsides. They are nonrenewable. Also, burning them releases carbon dioxide, a greenhouse gas. As people burn more and more fossil fuels, the level of carbon dioxide in our air rises. This warms our planet, creating problems for living things all over the world. To solve this problem, Yang’s team is taking inspiration from nature. Plants (and a few single-celled creatures) have an amazing ability. They can change the Sun’s energy into chemical energy. During photosynthesis, plants capture the energy in sunlight and store it in the chemical bonds of sugar molecules. This sugar fuels everything plants do—from growing and reproducing to making more leaves, flowers, and seeds. The fossil fuels we use today come mostly from the decayed remains of plants that used photosynthesis to store solar energy millions of years ago. “We are interested in replicating that process by using artificial photosynthesis to turn renewable solar energy into fuels,” Yang said. Yang’s lab group is developing catalysts to make this process feasible. Catalysts speed up chemical reactions that would otherwise be very slow. Yang and her colleagues make new chemicals from common metals. Then they test these chemicals to see how well they work as catalysts. The simplest fuel is hydrogen. It is clean and renewable. One way to obtain hydrogen is to use solar energy to separate the “H” from H2O—water. Scientists have come up with catalysts to spur this reaction. But these catalysts are expensive or inefficient. Yang’s group is looking for new catalysts that are cheaper and better. Another cutting-edge area of research is recycling carbon dioxide from the atmosphere. This is just what plants do during photosynthesis—they take carbon dioxide out of the air and use solar energy to turn it into fuel. Yang and her team are working on catalysts to mimic this process. Fuels from recycled carbon dioxide could replace the carbon-based fuels we currently dig out of the ground. Burning these new fuels would still release carbon dioxide, but we would be recycling the same carbon dioxide instead of adding more to the air.